VINCENT CASTIGLIA at the Dorian Grey Gallery. Since Sheik ‘N’ Beik Art Collective met Vincent seven years ago, he has been developing a body of work with what some would consider an “unconventional” technique. The entire collection of his paintings was created exclusively in his own human blood. He believes that this singularly personal medium contains his own psychic energy, while working with it gives it an outlet and form. In doing so, he dissolves the barrier between art and artist in a most literal and immediate sense. In the wake of Vincent’s 33rd birthday, the age of the Christ’s crucifixion and resurrection, “Archetypes” has been curated by Julio Santo Domingo, Roger de Cabrol, and Benjamin Larretche from the Sheik ‘N’ Beik Art Collective, to showcase the relative themes of death and rebirth in Vincent’s work. The exhibition opening will mark the launch of Castiglia’s official partnership and collaboration with the Sheik ‘N’ Beik Collective. Vincent’s paintings are monochromatic tableaux examining life, death, and the human condition. 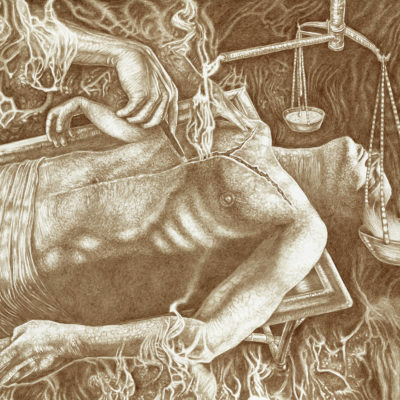 While many surrealists cite fantasy or dream as their inspiration, Castiglia’s canvases are connected to a life story, which is highly allegorical. Vincent’s paintings have been exhibited at msueums and galleries in the US, and internationally. He is the first American artist to receive a solo exhibition invitation from Oscar Award-winning artist H.R. Giger to exhibit in the H.R. Giger Museum Gallery. A native New Yorker, Vincent continues to live and work in the City. The “Archetypes” exhibition will consist of 19 works; 18 original paintings as well as one sculptural work, spanning 10 years, as well as several paintings never before exhibited all done using his own blood. 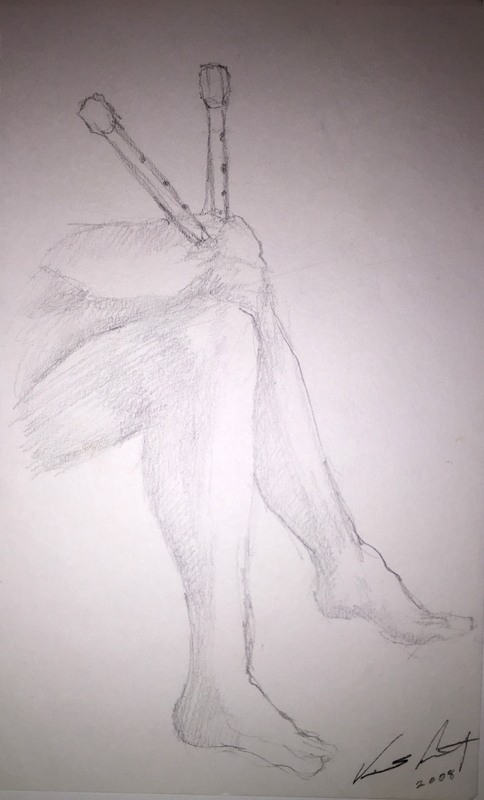 The exhibition title describes the various archetypal figures depicted throughout the body of paintings, representing various stations of human experience. Vincent Castiglia’s exhibit will run from April 16th until April 30th, 2015. Sheik ‘N’ Beik was born on the foundation of experimenting and challenging the senses. As our growth cycle continues and we reach higher levels of consciousness, we also act as a biosphere offering a nurturing habitat where our engineers are free to bask under the dome of our mind-expanding journey. Located in the heart of New York’s East Village, the Dorian Grey Gallery is the source for the most authentic works of art connected to the history New York City. The gallery is a collaborative venture with veteran New York gallerists Christopher Pusey and Luis Accorsi. With a keen eye focused on street art / graffiti and the New York emerging art scene, Dorian Grey Gallery continues to be the premier source for “authentic” NYC art.